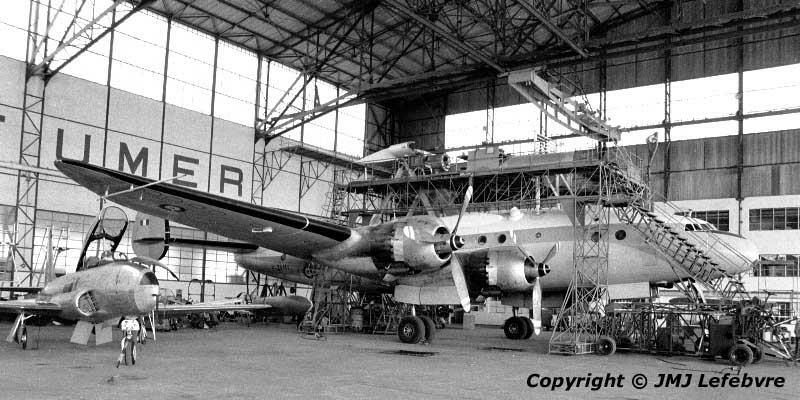 Registered F-ZVMV, it corresponded to Lockheed Constellation C/n 2503. Property of ENSA, the Upper School for Aeronautics, the establishment was considered as an annex of CEV, it was used as a flying test bed for any experiment purposes in the frame and engine studies leading pupils to be graduated as engineers and join top jobs in all the civil and military research or production establishments. This particular Lockheed Constellation had as registration: N 86520, XA-GOQ and for France F-BAZR under the colours of Air France. Possibly this Connie, after AF was passed or loaned during the sixties to Armée de l'Air as SAR aircraft and possibly I flew it during February 1962 for various rescue exercises at very low level inside the Algiers Bay, in North Africa. The aircraft was then silver and orange day-glo. Here, it carries on the rear series of masts various aerodynamic sections of fuselage and jet-engine cowlings. From March 3, 1971 this Constellation of ENSA was used for the first in-flight tests of the Turbomeca/SNECMA LARZAC O1 jet-engine prototype, the basic civilian version. Work was in full procezss with the military 04 which had been selected as the future powerplant for the Dasault-Bréguet/Dornier Alppha-Jet trainer and light-attack aircraft having just ended its definition stade on February 15. Around 1976, the Sud Aviation Caravelle N°193 F-ZACF replaced his Constellation which became the property of the French Air & Space Museum installed on the historic Le Bourget Air Port, a few miles north of Paris.